We all know that referral marketing is the quickest-growing and most cost-effective form of new customer acquisition. Just look at the conversion rates we achieve across all our clients – anywhere between 6 and 16 times the general retail benchmark of 2.6%. But, in the Grocery sector, we absolutely excel – helping our clients achieve conversion rates up to 69%. 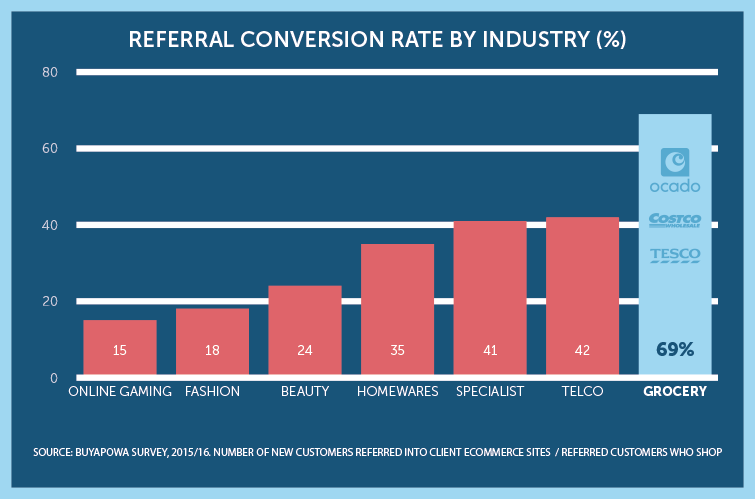 And these aren’t conversions from returning customers who you’d expect to shop. These are conversions from brand new customers – the kind of visitors who usually bounce from your site without checking out. You can’t achieve these kinds of results any other way, so don’t miss out on this opportunity to make a real difference. For more info or a demo of our platform please shout.